My name is Lindsey Wilmot, I am 35 years old. In March 2007 Jacob, our son was born. His father Julian Thewlis and I have been together for 14 years and have no other children. Jacob is our world. We live in the Barnsley area in South Yorkshire. In the December of 2008, Jacob fell ill. After numerous visits to our GP we were referred to Barnsley Hospital for an appointment in March 2009. In the few weeks leading up to this appointment, Jacob felt funny on his legs. We took him through to A&E and they put his leg in a cast for 10 days. During this time he had stopped eating/ sleeping, I had called the consultant at the hospital and was told that on the day of Jacob’s cast removal we should bring him in for a blood test. This was Friday 6th March, 7 days before our intended appointment. That evening we received a telephone call asking us to take Jacob to SCH the next morning. Saturday the 7th March – two days before his second Birthday our son Jacob was diagnosed with ALL – Acute Lymphoblastic Leukaemia. 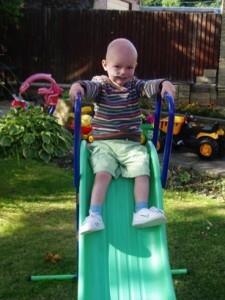 Jacob has been receiving treatment now for 33 months, and will end his treatment in June 2012 ! We know that this won’t be an end to the visits to SCH or the end of any help and support we may need along the way, of that I am sure. One of the first visitors to our room in that first week of our stay in hospital was Beryl. With a smile on her face, she made me feel more comfortable, explaining who and what they, as a charity did. If I’m completely honest, I probably didn’t take it all in then and there. But knowing that the charity is based within the hospital building, and have approachable, lovely women behind that door makes it easy to go and ask any questions you may have. PACT have been great, organising days out for all the families. We have attended Thomas Land, Flamingo Land and Sundown Adventure Land to name a few. It’s lovely that the kids have a social event to look forward to with the company of the other “clinic kids” because the kids here really do get to know each other and have fun. The Christmas party is enjoyed by kids and adults alike. A lot of effort, by a lot of people goes into making sure the day goes well for everyone. PACT also have two caravans – one at Primrose valley in Filey, and the other at Berwick Upon Tweed. Both are beautiful, well equipped caravans. We have spent a week at both of these and had a fantastic time. Although we are fortunate enough to live fairly local to the hospital, PACT also run PACT House for the use of families who find it difficult to travel whilst their child is staying in hospital receiving treatment. Even in the very beginning, we were given a welcome pack contain information as well as vouchers for the infamous Scotts bakery. Even now, on our monthly visits to clinic, The door is always open and both Jill and Beryl happy to help with anything. It’s not something we would have thought about happening to us when our son was born, but we have met some amazing new friends along the journey!